Former East County Times and Dundalk Eagle news reporter Ben Boehl has announced that he will run for the House of Delegates in District 8 as a Republican. Boehl resides in Perry Hall with his wife Mary and children Andrew, Emily and Adam. “I am a local guy who has been a life-long resident of Baltimore County. I am a product of Baltimore County Public Schools (BCPS) and a graduate of CCBC and Towson University. I am married with three kids who also attend BCPS,” Boehl said. As a parent, Boehl says he is aware of the overcrowded schools in northeast Baltimore County and would like to work with BCPS to secure state funding for that issue. Boehl saus he is also concerned about vacant properties in the 8th District and wants to improve the housing market. In his free time, Boehl also maintained a blog called “Benstorming” that focused on political and community news in eastern Baltimore County. He has also given a journalism scholarship to a student at his high school Patapsco High School Center for the Arts. Boehl left journalism and joined Delegate Bob Long as a Legislative Aide in Annapolis in 2016. Boehl helped get bills HB 1253 (the Abandoned Sunken Vessel bill) and HB 1323 (a five-year tax credit for homeowners who revitalize vacant or rundown properties) passed and signed into law. He recently worked with Delegate Long on his Active Assailant Training bill and helped constituents resolve personal issues by working with BGE, MVA, MTA and other state agencies. Boehl called it a “great experience” to work with Delegate Long as they both worked to help promote Governor Larry Hogan’s agenda of lowering taxes and increasing jobs. Although, Boehl said that Annapolis has frustrating moments too. 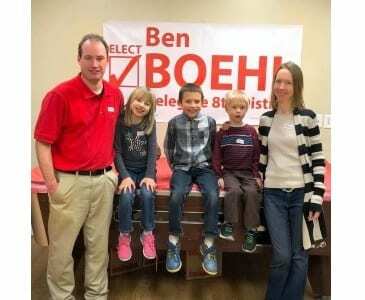 For more information about Ben Boehl’s campaign, visit www.electbenboehl.com.